Consolidation Period: From January 1, 2016 to the e-Laws currency date. 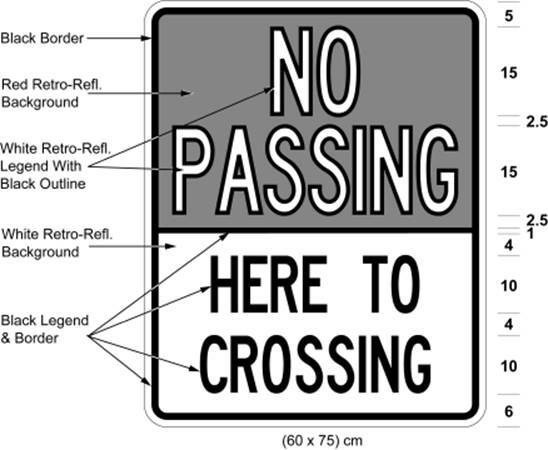 (b) the word “markings” in the provisions refers to “background”, “border”, “outline”, “stripe” and “symbol” in the Figures and to roadway markings in the diagrams. 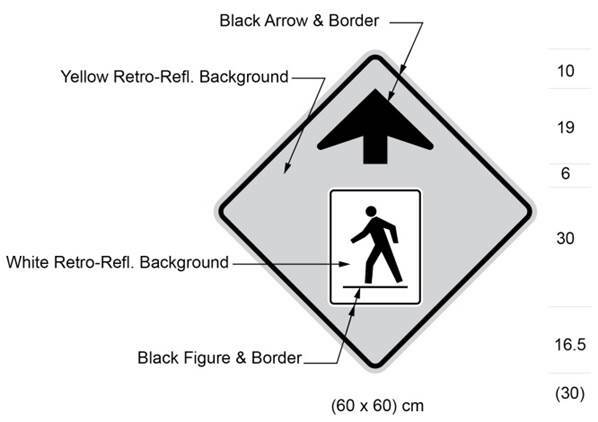 (b) by the Level 2 pedestrian crossover signs described and illustrated in section 6 and erected in accordance with section 7 and by the markings described and illustrated in section 8. 4. One or more signs illustrated in paragraph 4 of subsection (1). (3) The signs illustrated in paragraph 4 of subsection (1) shall be continuously illuminated on both sides from the inside and shall project light downward to illuminate the pedestrian crossing from one edge of the roadway to the other. (c) at a point not more than 4 metres from the edge of the roadway, adjacent to the place where the pedestrian crossover illustrated in section 5 meets the edge of the roadway. (2) The sign illustrated in paragraph 2 of subsection 3 (1) or paragraph 2 of subsection 3 (2) shall be erected in the same manner as and immediately below the sign illustrated in paragraph 1 of the same subsection. (d) such that the sign illustrated in paragraph 3 of subsection 3 (2) is below or to the right of the sign illustrated in paragraph 3 of subsection 3 (1). (4) Where the roadway has been divided into two clearly marked lanes for traffic, the sign illustrated as Figure 1 of paragraph 4 of subsection 3 (1) shall be erected above the pedestrian crossover facing vehicular traffic as nearly as practicable over the centre of the roadway. 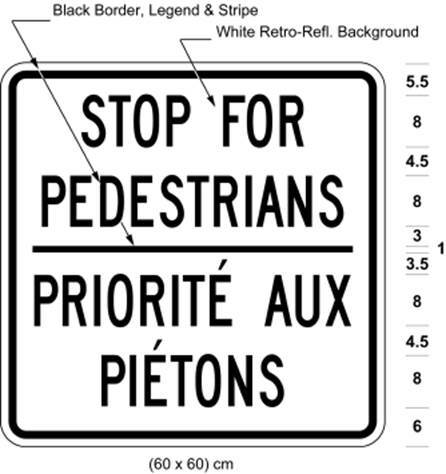 (5) Where the roadway has been divided into more than two clearly marked lanes for traffic, two signs illustrated as Figure 1 of paragraph 4 of subsection 3 (1) shall be erected such that one sign is erected as nearly as practicable over each half of the roadway above the pedestrian crossover facing vehicular traffic. 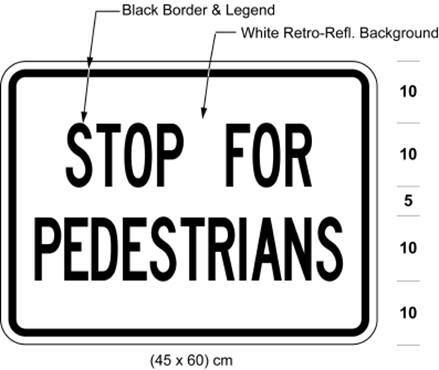 (6) Where the characteristics of the highway require a combination of the signs illustrated as Figure 1 and Figure 2 in paragraph 4 of subsection 3 (1), the signs shall be erected above the pedestrian crossover facing vehicular traffic as nearly as practicable over the centre of the roadway or over the centre of each half of the roadway. (7) A sign erected under subsection (4) shall have four circular pedestrian-activated flashing amber beacons such that there are two beacons, mounted back to back, on each end of the sign. (8) Signs erected under subsection (5) or (6) shall have a total of four circular pedestrian-activated flashing amber beacons such that there are two beacons, mounted back to back, near the inside end of each sign and as close as practicable to the centre of the roadway. (9) For each direction of travel on the roadway, the beacons required by subsection (7) or (8) shall be illuminated and flash alternately when activated by a push button or other device, and shall not otherwise be illuminated or flash. 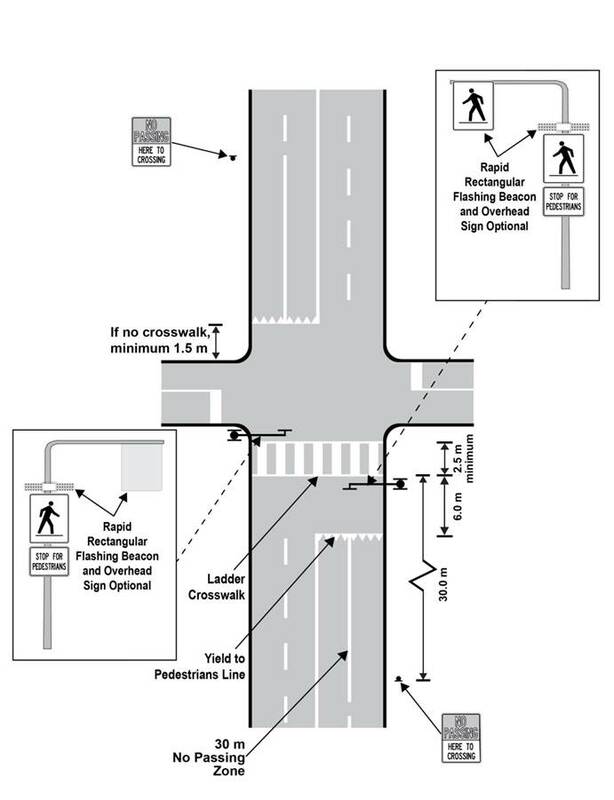 Text alternative: Diagram of an overhead view of a pedestrian crossover at an intersection on a four-lane roadway. Two “X” markings of 2.5 x 6 m size appear on the roadway in the two lanes approaching the crossover and are set 30 m back from the crosswalk lines. The crossover has double crosswalk bars marking the roadway in the southern leg of the intersection that measure 15 cm to 20 cm wide and 15 cm to 20 cm apart. 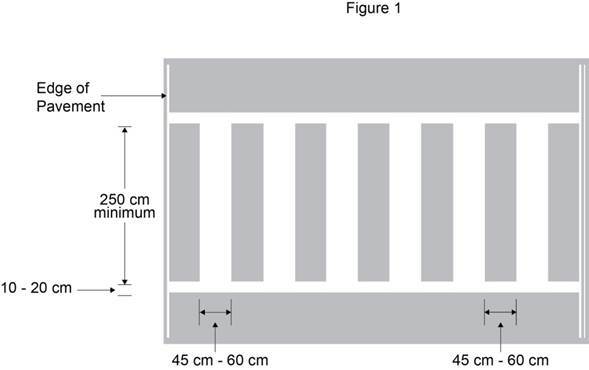 The space between the two sets of double bars is not less than 2.5 m wide. The stroke width of solid “x” markings is 30 to 50 cm and outlined “X”s must have a minimum line width of 10 cm. This text alternative is provided for convenience only and does not form part of the official law. 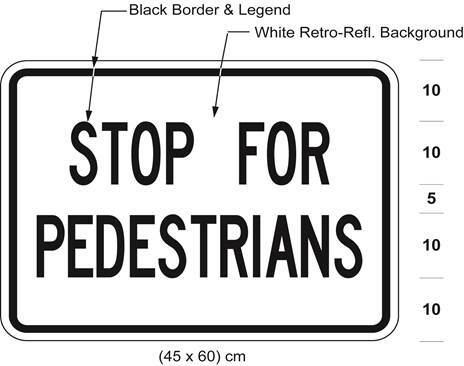 Text alternative: Diagram of an overhead view of a mid-block pedestrian crossover on a four-lane roadway. Two “X” markings of 2.5 x 6 m size appear on the roadway in the two lanes approaching the crossover and are set 30 m back from the crosswalk lines. The crossover has double crosswalk bars marking the roadway that measure 15 cm to 20 cm wide and 15 cm to 20 cm apart. The space between the two sets of double bars is not less than 2.5 m wide. 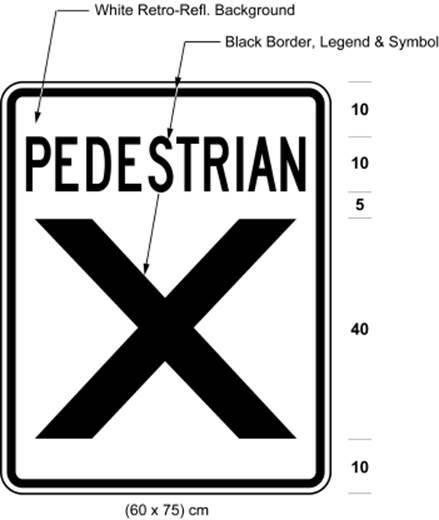 The stroke width of solid “x” markings is 30 to 50 cm and outlined “X”s must have a minimum line width of 10 cm. This text alternative is provided for convenience only and does not form part of the official law. Text alternative: Illustration of diamond-shaped sign, with a yellow background and black arrow pointing up and, at its centre, a sign with the symbol in black of a person crossing the road from right to left on a white background. Sign size indicated (60 x 60 cm). This text alternative is provided for convenience only and does not form part of the official law. 1. The signs illustrated in paragraph 1 of subsection (1). 4. The sign illustrated in paragraph 4 of subsection (1). 1. For each direction of travel, each sign shall be erected in two places on the same standard, mounted back to back, so that the signs face in opposite directions and one sign faces approaching traffic. 2. 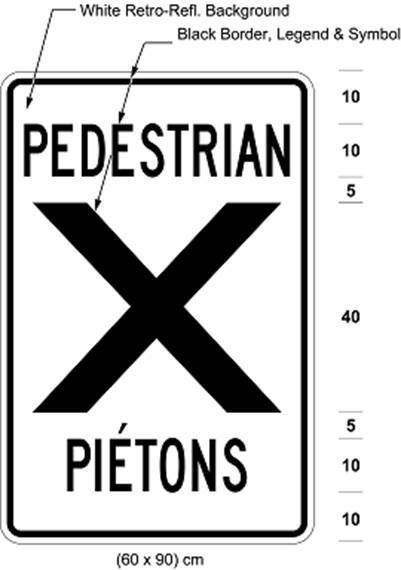 Each sign shall be at a point not more than 4 metres from the edge of the roadway, adjacent to the place where the pedestrian crossover described and illustrated in section 8 meets the edge of the roadway. 3. Where the highway is divided into two separate roadways, the sign illustrated as Figure 2 shall be erected on the left side of each roadway facing traffic at a point not more than 4 metres from the edge of the roadway. (b) with the bottom of the sign not less than 1.5 metres from the ground. (3) Subsection (2) does not apply to the signs illustrated in paragraph 1 of subsection 6 (1) that are mounted overhead as set out in subsection (5) or (6). (c) such that the sign illustrated in paragraph 3 of subsection 6 (2) is below or beside the sign illustrated in paragraph 3 of subsection 6 (1). (5) Where the roadway has been divided into two clearly marked lanes for traffic, the sign illustrated as Figure 1 in paragraph 1 of subsection 6 (1) may also be erected above the pedestrian crossover facing vehicular traffic as nearly as practicable over the centre of each lane. 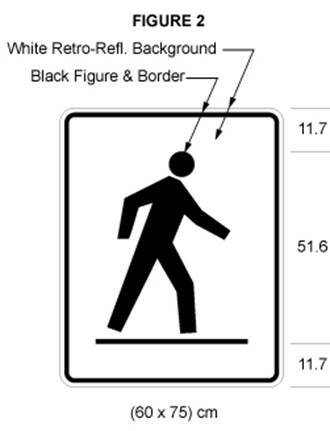 (b) the sign illustrated as Figure 2 in paragraph 1 of subsection 6 (1) may also be erected above the pedestrian crossover on the left side facing vehicular traffic approaching on the right side of the roadway as nearly as practicable over each half of the roadway for each direction of travel. (7) A rapid rectangular pedestrian-activated flashing amber beacon may be erected directly above the signs illustrated in paragraph 1 of subsection 6 (1) as illustrated in section 8. (8) For each direction of travel where a rectangular beacon described in subsection (7) is erected, each indication shall be illuminated and flash alternately when activated by a push button or other device, and shall not otherwise be illuminated or flash. 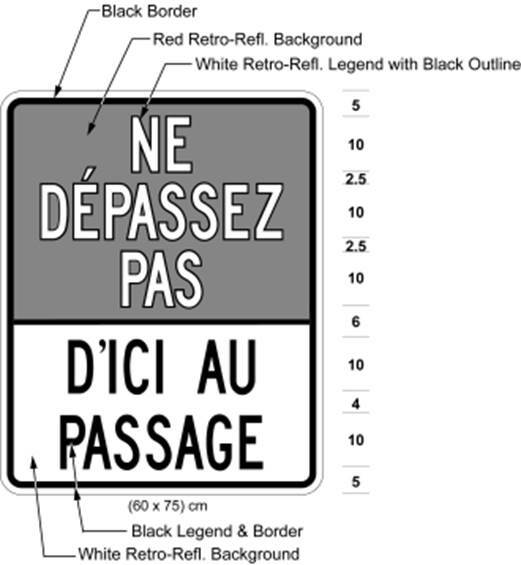 (9) The sign illustrated in paragraph 4 of subsection 6 (1) may be erected on the right side of the highway facing approaching traffic no more than 100 metres before the sign illustrated in paragraph 3 of that subsection. 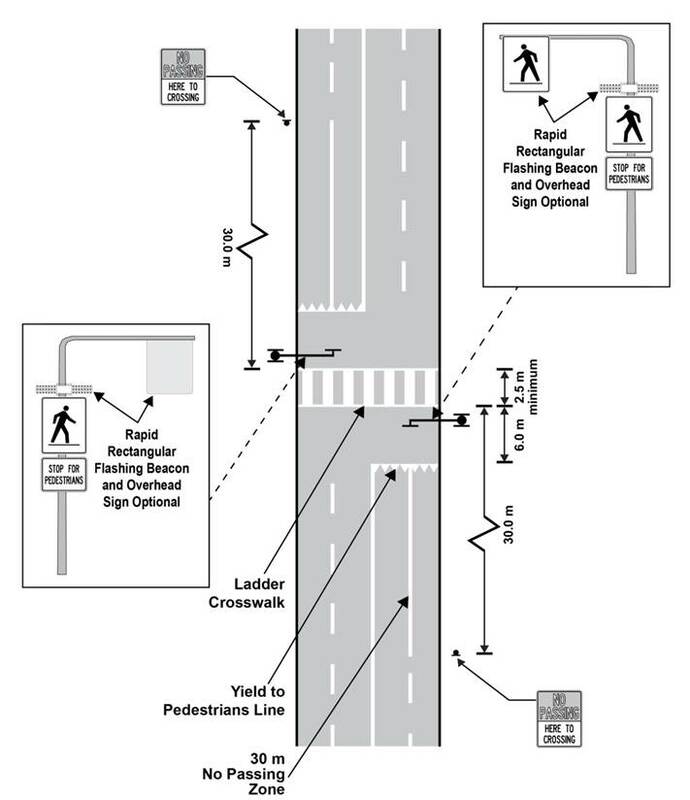 Text alternative: Diagram of an overhead view of a pedestrian crossover at an intersection on a four-lane roadway. A ladder crosswalk, consisting of many parallel bars positioned between two horizontal outer lines and with a minimum width of 2.5 m, runs from one edge of the roadway to the other. A yield to pedestrians line, known as shark teeth, is positioned on each side of the crossing 6 m back from the outer crosswalk lines. No passing zones are indicated with solid pavement markings in the traffic lanes starting at the yield to pedestrians lines and continuing for a distance of 30 m. The placement of the signs described in paragraphs 1, 2 and 3 of subsection 6 (1) and in subsection 7 (5) and of rapid rectangular flashing beacons described in subsection 7 (7) are shown. This text alternative is provided for convenience only and does not form part of the official law. 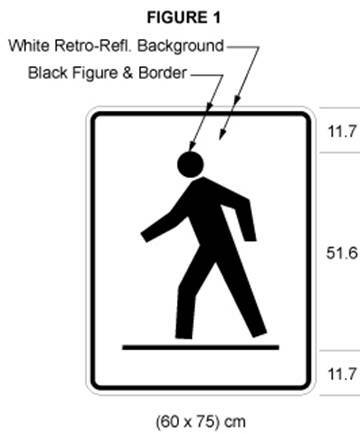 Text alternative: Diagram of an overhead view of a mid-block pedestrian crossover on a four-lane roadway. A ladder crosswalk, consisting of many parallel bars positioned between two horizontal outer lines and with a minimum width of 2.5 m, runs from one edge of the roadway to the other. A yield to pedestrians line, known as shark teeth, is positioned on each side of the crosswalk 6 m back from the outer crosswalk lines. No passing zones are indicated with solid pavement markings in the traffic lanes starting at the yield to pedestrians lines and continuing for a distance of 30 m. The placement of the signs described in paragraphs 1, 2 and 3 of subsection 6 (1) and in subsection 7 (5) and of rapid rectangular flashing beacons described in subsection 7 (7) are shown. This text alternative is provided for convenience only and does not form part of the official law. 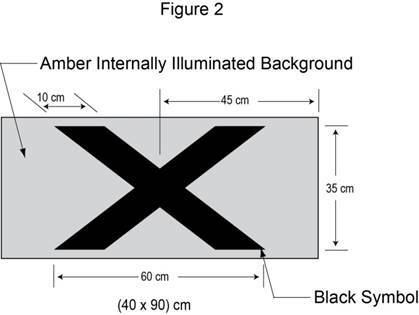 Text alternative: Illustration of pavement markings for a ladder crosswalk. This is a line of parallel bars separated by spaces and positioned between two horizontal bars. Each parallel bar and each space is between 45 and 60 cm wide. This text alternative is provided for convenience only and does not form part of the official law. 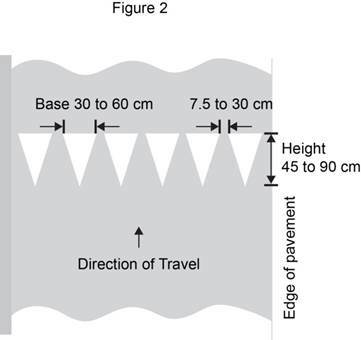 Text alternative: Illustration of pavement markings for a shark teeth yield to pedestrians line. This is a line of triangles with the bottom points facing the direction of approaching traffic. The base of each triangle is between 30 and 60 cm wide and the space between each triangle at the base is between 7.5 and 30 cm wide. This text alternative is provided for convenience only and does not form part of the official law.